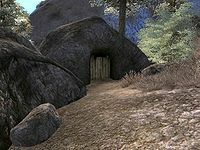 Boreal Stone Cave is a small empty cave west of Bruma (quest-related). It contains only one zone, Boreal Stone Cave. 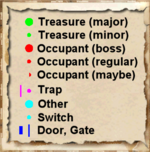 This cave can be entered and fully explored before starting the related quest. In this case, Raynil Dralas and the Waterlogged Chest won't appear. 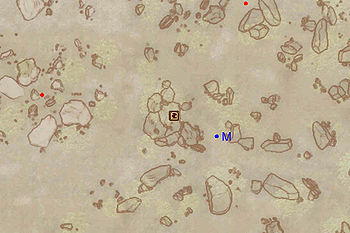 This location's map marker (M on map) is named Boreal Stone Cave (editor name BorealStoneCaveMarker). The entrance door is WNW of the marker, 60 feet away. 2 Wilderness Creatures (Mountains variety) are near the entrance. 1 Wilderness Creature (Snowy Mountains variety) is near the entrance. This cave is quite small and linear. If you have started the related quest, the very first room will contain a Waterlogged Chest (Q) and Raynil Dralas (R) who will attack you on sight. Continuing through the cave will lead you to two minor loot chests.